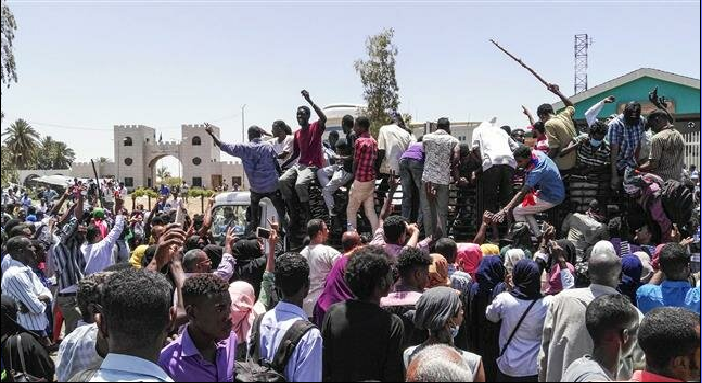 The sit-in was being held just outside the gates of the Defense Ministry headquarters in the Sudanese capital for the third consecutive day early on Tuesday when security forced were reportedly deployed to disperse the crowd. Protest organizers said National Intelligence, Security Service, and riot police personnel arrived and fired tear gas at the protesters. Witnesses said soldiers from within the Defense Ministry then opened the gates to allow the protesters in and several times fired shots into the air to ward off the security forces. It was not clear whether the standoff escalated or was diffused. Anti-government rallies reached a peak in Sudan’s capital on Saturday and Sunday, when thousands of Sudanese launched the biggest rally since protests first erupted in the country in December last year. At least seven people were killed during the protests on the two days and 15 civilians and 42 members of the security forces were injured. Sudan has been struggling with persisting protests since December 17, when an anti-government campaign erupted over price hikes and shortages of food and fuel. That initial public display of anger quickly spiraled into calls for the 75-year-old Bashir — who took power in 1989 through a military coup — to step down. The embattled president has declared a state of emergency, dissolved the central government, and replaced state governors with security officials. But the rallies have not stopped.